We’d love your help. Let us know what’s wrong with this preview of Murder in Her Stocking by G.A. McKevett. As the Moonlight Magnolia Agency revisits old memories on Christmas Eve, Granny Reid takes the reins back thirty years to the 1980s--back when she went by Stella, everyone's hair was bigger, and sweaters were colorful disasters. But murder never went out of style . . .
Christmas has arrived in sleepy McGill, Georgia, but holiday cheer can't keep temperamental Stella Reid fr As the Moonlight Magnolia Agency revisits old memories on Christmas Eve, Granny Reid takes the reins back thirty years to the 1980s--back when she went by Stella, everyone's hair was bigger, and sweaters were colorful disasters. But murder never went out of style . . .
Christmas has arrived in sleepy McGill, Georgia, but holiday cheer can't keep temperamental Stella Reid from swinging a rolling pin at anyone who crosses her bad side--and this season, there are plenty. First an anonymous grinch vandalizes a celebrated nativity display. Far worse, the scandalous Prissy Carr is found dead in an alley behind a tavern. With police puzzled over the murder, Stella decides to stir the local gossip pot for clues on the culprit's identity . . .
To ask other readers questions about Murder in Her Stocking, please sign up. Murder in Her Stocking by G.A. McKevett is the first book in the new A Granny Reid Mystery series. This series however seems to be a prequel spin off series to the author’s long running Savannah Reid series featuring Savannah’s grandmother Stella Reid. Stella Reid is a grandmother to seven young children who’s mother isn’t the best role model ever often choosing to go out and drink than watch her kids leaving Stella to pick up the slack. Stella is not one to back down to anyone or any challenge t Murder in Her Stocking by G.A. McKevett is the first book in the new A Granny Reid Mystery series. This series however seems to be a prequel spin off series to the author’s long running Savannah Reid series featuring Savannah’s grandmother Stella Reid. Stella Reid is a grandmother to seven young children who’s mother isn’t the best role model ever often choosing to go out and drink than watch her kids leaving Stella to pick up the slack. Stella is not one to back down to anyone or any challenge though and those kids mean the world to her. When Stella is out one night though she hears a scream and when going to investigate she finds Prissy Carr in the alley behind the tavern. With the help of her grandkids Stella knows a murderer is on the loose and she’ll do whatever it takes to find them before Christmas. Again I have accidentally stumbled into a series that while this is the beginning it’s also a spin off leaving me the feeling that I was missing something or other when I started reading. For me that feeling that things weren’t introduced as new to readers leaves me a bit disconnected to a story. Stella “Granny” Reid also seemed to be doing a lot more interacting with the kids than solving a murder, which makes sense when her granddaughter will become a sleuth herself one day, but that also seemed to slow this down a bit. I think fans of the original series will probably love this one but not being familiar with it myself it was just an OK read. I absolutely loved this book. I can not wait for the next one. This is a story of a 50+Grandma taking care of her 6 grandchildren because their mom is a drunk and their dad would rather stay away than come home and raise them. This Grandma is no nonsense but also loves them with all her heart. To teach them values and wrong from right and there are consequences and they love her in return. There is a part at the beginning when her grandson had me laughing so hard because of something that a man I absolutely loved this book. I can not wait for the next one. This is a story of a 50+Grandma taking care of her 6 grandchildren because their mom is a drunk and their dad would rather stay away than come home and raise them. This Grandma is no nonsense but also loves them with all her heart. To teach them values and wrong from right and there are consequences and they love her in return. There is a part at the beginning when her grandson had me laughing so hard because of something that a man had said to Stella in front of the kids. Also there is a murder and Stella helps the sheriff solve it. Also Stella's best friend and neighbor is dealing with an abusive husband. I could not stop reading this. 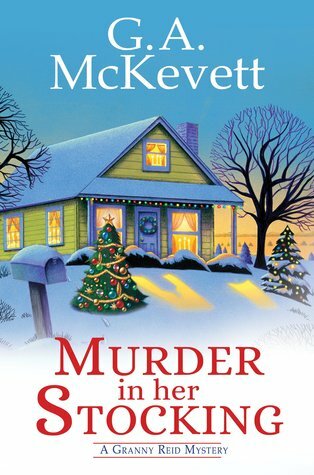 Murder in Her Stocking is an exciting start to the new Granny Reid series by G. A. McKevett. This story goes back to a time that will leave you laughing and crying, and hoping the story never ends. We learn how all 7 of her grandchildren come to live with Granny Reid and the heroics of a young Savannah. I read this book in two days, only because I had to get some sleep in between. I love this first in a new series and cannot wait to read the next book in the series. 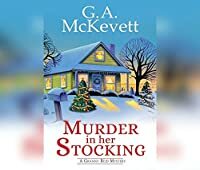 I volunteered to read and review a Murder in Her Stocking is an exciting start to the new Granny Reid series by G. A. McKevett. Murder in Her Stocking by G. A. McKevett is a stand alone mystery that is also a prequel to her popular Savannah Reid mystery series. As a mystery it stands alone, but much of the book is also exposition for Savannah Reid and others of the Reid family. Because this was the first book in the series for me, I was somewhat at a loss as it began, feeling as if I should know these characters better than I did. The story of the Reid family, and Granny Reid in particular, is more prominent than the my Murder in Her Stocking by G. A. McKevett is a stand alone mystery that is also a prequel to her popular Savannah Reid mystery series. As a mystery it stands alone, but much of the book is also exposition for Savannah Reid and others of the Reid family. Because this was the first book in the series for me, I was somewhat at a loss as it began, feeling as if I should know these characters better than I did. The story of the Reid family, and Granny Reid in particular, is more prominent than the mystery itself. Throughout the novel there was emphasis on creating the atmosphere of the poverty stricken Reid family in the hardscrabble town of McGill, Georgia. The narrative was made up of an abundance of colloquialisms and other southern phrases, some more famous than others. There was a familiarity in these initially that helped to create the book’s atmosphere, but they became somewhat redundant as they were used so often they created a feeling the author had a list of sayings she was determined to include before the book ended. Overall, the story of the Reid family comes across as a bit cliche. It’s the typical portrayal of the simple, but good, uneducated southerners who have hearts as good as gold and an abundance of common sense. The story is written to occur at Christmas, during a cold winter, but the feel is more consistent with barefoot children shuffling down a dirt road on a long hot summer’s day and adults spending the majority of their time gossiping about the other adults in their small community while fanning themselves with a hand-held funeral home fan. Until the final few chapters, it was only with an occasional reference to the cold, or to a typical Christmas activity such as buying a tree, that would remind me the story actually took place in December. The timing was made clear in the prologue of the story, but was quickly forgotten as I became engaged in the story itself. I found the mystery of “who done it” easy to solve, as well as the process to lead to the unmasking of the murderer which was a bit of a mystery of its own. Because the solution of the murder was not as central to the book as some of the other storylines, there were some good clues, but not many red herrings. This resulted in the feeling more of reading a novel about the Reid family than a mystery novel with well identified suspects, clues and false trails. As such, it may be more enjoyable for people who are acquainted with the Savannah Reid mystery series and who would like more information on her early days, along with more in depth information on the early years of her family. Definitely my favorite cozy of the year! This was the sweetest book. Part women's fiction, dash of romance and gentle cozy. Loved granny Reid so much! I love G A Mckevett Savannah Reid series so I was excited to learn Granny Reid was getting her own series. This story takes place before the Reid kids came to live with Granny. Granny, Savannah and Waycross are out and her a woman scream. Granny sends the kids to the police station and goes back to help the person. She is of course too late. The sherif asks for her help and of course Savannah helps as she wants to be a policewoman when she is older. The book also shows how the kids came to live w I love G A Mckevett Savannah Reid series so I was excited to learn Granny Reid was getting her own series. This story takes place before the Reid kids came to live with Granny. Granny, Savannah and Waycross are out and her a woman scream. Granny sends the kids to the police station and goes back to help the person. She is of course too late. The sherif asks for her help and of course Savannah helps as she wants to be a policewoman when she is older. Murder in Her Stocking is the first Granny Reid mystery, and it's the first book I've read by G.A. McKevett. I loved the uniqueness of this cozy mystery. This story is set in the 80s and visits Stella Reid and her grandchildren during the Christmas season. There's been a murder and Stella is trying to help the sheriff solve it. In addition to that, she is dealing with her daughter-in-law Shirley mistreating her seven children. There was a great deal of character and story development taking plac Murder in Her Stocking is the first Granny Reid mystery, and it's the first book I've read by G.A. McKevett. I loved the uniqueness of this cozy mystery. This story is set in the 80s and visits Stella Reid and her grandchildren during the Christmas season. There's been a murder and Stella is trying to help the sheriff solve it. In addition to that, she is dealing with her daughter-in-law Shirley mistreating her seven children. There was a great deal of character and story development taking place outside of the mystery. This read a lot like an inspirational/women's fiction featuring a mystery. Murder in Her Stocking dealt with heavier issues than you would typically find in a cozy and made for a solid story. The story is tender and full of Christmas magic. Being set in Georgia, there was plenty of Southern sayings and some had me laughing out loud. I am looking forward to visiting with Granny Reid and her grand-angels again. Murder in Her Stocking by G.A. McKevett is the first book in the new A Granny Reid Mystery series. This is actually a prequel series to her successful Savannah Reid series. This series goes back to the 1980s when Stella, Granny Reid, is taking care of her grandchildren as her no-good son isn't around and her daughter-in-law is drinking and carousing instead of being home looking after her seven children. Those kids mean the world to her, and she will do whatever she can to keep them safe and mak Murder in Her Stocking by G.A. McKevett is the first book in the new A Granny Reid Mystery series. This is actually a prequel series to her successful Savannah Reid series. This series goes back to the 1980s when Stella, Granny Reid, is taking care of her grandchildren as her no-good son isn't around and her daughter-in-law is drinking and carousing instead of being home looking after her seven children. Those kids mean the world to her, and she will do whatever she can to keep them safe and make them happy. The children are fun, normal kids who are not bad, but do make some inappropriate decisions. When Stella, and two of the kids are out fixing a mistake made by Waycross, they hear a scream. When going to investigate Stella finds Prissy Carr in the alley behind the tavern, dying. She sends the kids to the sheriff's office and she stays with Prissy hearing her dying words. She feels bad about the murder, even though most of the women in town are rather happy that their husbands will no longer be stepping out with Prissy. With so many not caring about the death, Stella is determined not to let someone get away with murder. This is an introduction to a new series, as well as a prequel to another, so this book seems to spend more time on the family and their situation than on the actual mystery and sleuthing. That being said, I did enjoy the southern setting, expressions and situations. This story takes place during the recession of the 80s so there is a lot of financial issues as well, but the town comes together to make sure the kids have a wonderful Christmas. I loved the expressions used by Stella and the kids. "You don't have the sense God gave liverwurst, and your heart's nothin' but a thumpin' gizzard." "When that child has a mind to, she clams up tighter than a bullfrog's keister in a bucket of ice water." A cozy mystery set in the South with a strong matriarch? Heck, yes! Similar to Christmas Cake Murder by Joanne Fluke, Murder in Her Stocking revisits a beloved mystery series with a prequel. truth be told, I’m brand new to the Savannah Reid series. But, as soon as I saw the heartwarming holiday cover for Murder in Her Stocking, I was desperate to read it. Starting a new series is so exciting, If you love the characters and the setting, you know you’ll be in for a long road of beloved stories. Luckily for readers, the Granny Reid series is a winner. Stella is such an awesome character. First, she’s hilarious & keeps it REAL. She’s not putting on airs, trying to be someone else. When the going gets tough, she looks at the task at hand & figures out a way to get the job done. While this is a cozy mystery, G.A. Mc Kevett doesn’t shy away from serious issues. For example, Stella is so involved with her grandkids because her son, a long haul truck driver, is basically absent from their lives. Their mother, who can often be found on a barstool, is not any better. Now, I usually like my cozies to be absent of anything too rough, but this storyline melts my heart. We all know people in a similar situation as Stella. I’m talking about the people who sign up to care for kids when they need it most. This is Stella Reid. if her grandkids need her, she’s there for each & every one of them. She will fight tooth & nail to make sure they get what they need. Oh, I just love that this series is set in McGill, Georgia. This means the characters speak with a Southern dialect. YES! For me, this makes the story all the more real. G.A. McKevett throws some awesome sayings into the dialogue that will have you rolling with laughter. In Murder in Her Stocking, Mc Kevett introduces us to a cast of characters I’m looking forward to learning more about. Well, there’s the sheriff & I may see some sparks flying between him & Granny. There’s Stella’s neighbor with troubles of her own. Undoubtedly, Mc Kevett will continue to explore the dynamic between Stella & her son & daughter-in-law as well. Basically, I’ve met these folks & I want to know more about them! I am Really Into This book. I love starting a new series & I’m really excited about this one! Check out my interview with the author, G.A. Mc Kevett aka Sonja Massie here. Granny Reid, from the Savannah Reid Mystery series, is the headliner of this new series. It's all about the love as the Moonlight Magnolia Agency gathers on Christmas Eve, remembering the events leading up to the first Christmas the Reid children spent with their beloved Granny as their guardian is the basis of this story. Raising 7 children ages 11-6 in small town McGill Georgia has Stella Reid stretched. Finding herself holding Prissy Carr as she takes her last breath, Stella is determined to d Granny Reid, from the Savannah Reid Mystery series, is the headliner of this new series. Raising 7 children ages 11-6 in small town McGill Georgia has Stella Reid stretched. Finding herself holding Prissy Carr as she takes her last breath, Stella is determined to do right by Priscilla by helping Sheriff Manny Gilford investigate the murder. Meeting a young Savannah and seeing the dynamic woman who shaped her was a true cozy experience. I am looking forward to more Granny Reid stories. Murder in Her Stocking is the first book in G. A. McKevett’s Granny Reid Mystery series. This delightful read had me laughing aloud one moment and then reaching for a box of tissues the next. The storyline is well thought out, the well-developed characters are affable, is full of compassion and caring, and the dialogue is witty and engaging. There’s some adult language, but no graphic violence or sexually explicit situations. This quickly paced whodunit kept me guessing until the reveal. The Reid Murder in Her Stocking is the first book in G. A. McKevett’s Granny Reid Mystery series. This delightful read had me laughing aloud one moment and then reaching for a box of tissues the next. The storyline is well thought out, the well-developed characters are affable, is full of compassion and caring, and the dialogue is witty and engaging. There’s some adult language, but no graphic violence or sexually explicit situations. This quickly paced whodunit kept me guessing until the reveal. The Reid family and friends are gathered together on Christmas Eve in California and while Granny Reid is rocking her newborn great-granddaughter, Vanna Rose, she reminisces about the past. Her focus is on a Christmas season over thirty years earlier in McGill, Georgia, when her seven precious children came to live with her. Stella’s son, Macon, is an absentee father and her daughter-in-law, Shirley, neglects and abuses the children and spends too much time drinking in bars. While Stella Reid and two of her grandchildren, Savannah and Waycross, try to repair the town’s recently acquired nativity display that an “anonymous” person vandalized, trouble breaks out in the alley behind a tavern. After taking Savannah and Waycross to the nearby police station, Stella returns to the alley to help the person in distress and ends up holding Priscilla “Prissy” Carr in her arms as she takes her last breath. Prissy had a well-deserved reputation as a loose woman, but that doesn’t stop Stella from wanting to find her killer and provide peace in the afterlife for her. Savannah, who wants to be a policewoman when she grows up, wants to help her granny and Sheriff Manny Gilford solve the case. Small towns are notorious for their gossip circuits, and Stella stirs McGill’s up looking for clues. Stella and even Savannah, help Manny with his investigation into Prissy’s death and locating the “missing” husband of her friend, Florence Bagley. This is my introduction to the author and a new series entry intended as a prequel to the well-established Savannah Reid series. As such, this functions well as a standalone, although it took me a few chapters to get into the unique writing style. Very folksy; had me thinking it was not so much a cozy as literary fiction and slow southern, small town, down-home style of McGill, Georgia, at that. Not so sure it is as much mystery as it is the story of the Reid family. Strong characterizations--Gr This is my introduction to the author and a new series entry intended as a prequel to the well-established Savannah Reid series. As such, this functions well as a standalone, although it took me a few chapters to get into the unique writing style. Very folksy; had me thinking it was not so much a cozy as literary fiction and slow southern, small town, down-home style of McGill, Georgia, at that. Not so sure it is as much mystery as it is the story of the Reid family. Strong characterizations--Granny is bigger than life. Granny Reid, is the self-proclaimed caretaker of her seven grandchildren, her grand-angels. And Savannah (who will grow up to be second generation sleuth), the oldest at twelve, has had to grow up very quickly due to the fact that her absentee trucking father is on the road--most of the time and their mother occupies her bar stool--daily--and almost exclusively. The story starts with Stella Reid (better known as Granny Reid) holding her great-grandchild at a Christmas gathering. She begins musing thirty years previous to more tumultuous times and a whole other Christmas. The artfully laid out plot is heavy with clichéd sayings and little glimmers of Granny's wisdom bestowed with love and guidance to the little ones. Heaven knows they get none from their mother, Shirley. There is a murder and Granny takes on some sleuthing, along with Sheriff Gilford, though I loved that the sleuthing doesn't control the story--the Reid family does. It's a sweet story told in slow, cozy style. It is, however, well paced, keeping the reader engaged. I received this ebook download from the publisher and NetGalley for this book tour and greatly appreciate the opportunity to read and review. Recommended as a great Christmas season entry to your TBR. This narrative will captivate cozy readers, literary fiction readers, and those who enjoy the work of women sleuths. Murder in Her Stocking is a great start to a new series that is an off shoot to the Samantha Reid series. I have not read the series but this story has gotten me interested in looking into it. As the story starts, Stella "Granny" Reid is spending time with her adult grandchildren and friends at Christmas time when she is thinking back to another Christmas thirty years ago in McGill, Georgia-a Christmas that was good but also had some sadness. I was drawn in from the beginning and laughing out lo Murder in Her Stocking is a great start to a new series that is an off shoot to the Samantha Reid series. I have not read the series but this story has gotten me interested in looking into it. As the story starts, Stella "Granny" Reid is spending time with her adult grandchildren and friends at Christmas time when she is thinking back to another Christmas thirty years ago in McGill, Georgia-a Christmas that was good but also had some sadness. I was drawn in from the beginning and laughing out loud at the dialect, witty conversation between Granny and her seven "grand-angels," all named for towns in Georgia where their mother had lived. Stella is the only responsible person in the children's life. Their father, Macon, Stella's son, is on the road all the time and never around to help with the children while their mother, Shirley, spends all of her time at the local tavern. Savannah is the oldest and is very mature for a twelve year old because she has to look after the others. Waycross is the only boy and second to the oldest. Savannah devours Nancy Drew and Hardy Boys books and plans to become a policewoman when she grows up. She gets her chance at detective work when she and Stella along with Waycross hear a dying scream one night while taking care of some mischief that Waycross had gotten into. The local lady of the night, Priscilla Carr, has been injured and is dying when Stella reaches her after securing the kids at the sheriff's office. Many wives in the town have reason to kill Prissy but so do others-men who spent time with her. Besides the mystery of who killed Prissy, there is a secondary mystery when Bud, the abusive husband of Stella's friend Flo's, disappears after a big fight with Flo. This story is rich with small town colorful characters who love to gossip and know each other's business but also show support in a time of need. Stella and her son's family are poor as dirt but she is rich in love and respect for others, especially with her grand-angels. When Christmas Day arrives, Stella and the children have a special day with friends and a few lovely surprises. In this first book we are introduced to characters we are familiar with but are taken back thirty years to when they were kids and Granny was much younger. It's Christmas time in McGill, Georgia and the Reid children are staying with their Granny Reid while their mother is off partying. When the local nativity scene is vandalized and people are upset Granny has a feeling she already knows who the culprit is but not why he did it. Knowing that the vandalism must be fixed she comes up with a solut In this first book we are introduced to characters we are familiar with but are taken back thirty years to when they were kids and Granny was much younger. It's Christmas time in McGill, Georgia and the Reid children are staying with their Granny Reid while their mother is off partying. When the local nativity scene is vandalized and people are upset Granny has a feeling she already knows who the culprit is but not why he did it. Knowing that the vandalism must be fixed she comes up with a solution that should make everything better. While in the midst of fixing the nativity a scream rings out into the night. Granny immediately sends two of her grandkids for help while she checks out the situation. She comes across a young woman, Prissy, who is at deaths door. Prissy is known as the town whore and has no problem sleeping with married men. The list of suspects starts out small but when Granny realizes just how many married men the young woman has been with it seems never ending. Follow along as Granny tries to figure out who the killer is and at the same time keep her grandkids safe from a neglectful mother. Will she be able to find a killer? Will her grandkids pay for her wanting to take care of them? Dive in and answer these questions and more. I have loved each and every Savannah Reid story many times over, so I was super excited for the very first Granny Reid mystery as she is an absolute favorite book character in out house and I was not disappointed far from it this book is an absolute treasure. This is the first book I've read by this author and it was a fun read. I hope for many more in this series. It was interesting enough for me to add her to my TBR pile. Granny Reid is a great character. I received an eARC from the publisher via NetGalley for an honest review - try this book even if you haven't read her other series. I have read only one Savannah Reid mystery and wondered if I would be able to follow this new series which includes many of the same characters. Thankfully this series completely stands on its own and you don’t need to know anything about the author’s other successful series to fully enjoy this one. The writing was really excellent, a bit deeper than most surface cozies, but still something to curl up with on a cold night. The Christmas season was well described and I loved the unique setting of I have read only one Savannah Reid mystery and wondered if I would be able to follow this new series which includes many of the same characters. Thankfully this series completely stands on its own and you don’t need to know anything about the author’s other successful series to fully enjoy this one. The writing was really excellent, a bit deeper than most surface cozies, but still something to curl up with on a cold night. The Christmas season was well described and I loved the unique setting of a sleuthing grandmother watching over all of her grandbabies. An excellent book! I was sent a free copy of this book in exchange for my honest review. I was not financially compensated and all opinions are 100 percent mine. I absolutely adore cozy mysteries and Christmas, and this book combines my two loves in a very special way. The writing was exquisite, the characters were believable, and the mystery was difficult to figure out. This is easily one of the most delightful mystery books I have read in ages. What sets this book apart from the run-of-the-mill cozy mystery is tha I was sent a free copy of this book in exchange for my honest review. I was not financially compensated and all opinions are 100 percent mine. What sets this book apart from the run-of-the-mill cozy mystery is that it has more of a story than just the murder mystery. Stella is one of the most endearing sleuths I've read in a while, and the tales of her family and life and some of the most entertaining and heartwarming I've read. I found that this mystery encompassed the entire gamut of human emotion, and I hope this is just the first of many of these Granny Reid mysteries. I haven't read any of the Moonlight Magnolia Agency/Savannah Reid books but it turns out there is no need to as other than the first few and last few pages the rest of the book is set in the past. Granny Reid (Stella) is trying to give her grandkids a good upbringing and is fighting an uphill battle, her son drives a rig and is out of town most of the time, her daughter in law hates her but loves Elvis and alcohol (not necessarily in that order). The story opens with Stella looking after the ch I haven't read any of the Moonlight Magnolia Agency/Savannah Reid books but it turns out there is no need to as other than the first few and last few pages the rest of the book is set in the past. Granny Reid (Stella) is trying to give her grandkids a good upbringing and is fighting an uphill battle, her son drives a rig and is out of town most of the time, her daughter in law hates her but loves Elvis and alcohol (not necessarily in that order). The story opens with Stella looking after the children for a few days (so their mother doesn't have to), this means she needs to stretch her limited pension to provide food for 8 people! she is a strong woman mind you and is prepared to give what she can to her Grand Angels, as they are headed to the store they are side tracked by the fact that someone (and Stella has a darned good idea as to who) has vandalized the town Nativity Scene, but this fades into insignificance when later that evening Stella hears someone being attacked. Now she, the local law enforcement and a couple of good friends need to figure out what happened and hope that every one can have a wonderful Christmas Season. This is the first of a new series featuring Savannah Reid's grandmother Stella Reid and set in the small town of McGill, Georgia, when Savannah was just 12, and she and her 6 siblings were pulled back and forth between their mother and grandmother. Their mother is a neglectful mother and dedicated alcoholic who hates her mother-in-law with a loud passion. It is from their "Granny Reid" that the children find love and stability. Into this complex situation are added neighbors and friends missing This is the first of a new series featuring Savannah Reid's grandmother Stella Reid and set in the small town of McGill, Georgia, when Savannah was just 12, and she and her 6 siblings were pulled back and forth between their mother and grandmother. Their mother is a neglectful mother and dedicated alcoholic who hates her mother-in-law with a loud passion. It is from their "Granny Reid" that the children find love and stability. Into this complex situation are added neighbors and friends missing and in jeopardy, the pranked town nativity (shiny black mustaches on all the figures! ), the murder of the town floozy, and a kind and smart sheriff sweet on Stella. This is a wonderful small town story filled with believable, lovable characters, hard quandaries and decisions, and complicated relationships, plenty of humor (best funeral ever), all wrapped around the framework of a murder mystery. It is highly successful on all levels. I really enjoyed it. Christmas has arrived in sleepy McGill, Georgia, but holiday cheer can’t keep temperamental Stella Reid from swinging a rolling pin at anyone who crosses her bad side—and this season, there are plenty. First, an anonymous grinch vandalizes a celebrated nativity display. Far worse, the scandalous Prissy Carr is found dead in an alley behind a tavern. With police puzzled over the murder, Stella decides to stir the local gossip pot for clues on the culprit’s identity . . . I following the Savannah Christmas has arrived in sleepy McGill, Georgia, but holiday cheer can’t keep temperamental Stella Reid from swinging a rolling pin at anyone who crosses her bad side—and this season, there are plenty. First, an anonymous grinch vandalizes a celebrated nativity display. Far worse, the scandalous Prissy Carr is found dead in an alley behind a tavern. With police puzzled over the murder, Stella decides to stir the local gossip pot for clues on the culprit’s identity . . . I following the Savannah Reid series, this was a great backstory to Stella Reid (Granny Reid) and all the Reid family. A good cozy mystery and subplot the thing you would do for family. Since publication of her first novel in 1986, Sonja Massie has authored over sixty published works, including the highly popular and critically acclaimed SAVANNAH REID MYSTERIES under the pseudonym G. A. McKevett. Sonja's novels range from Irish historicals to contemporary thrillers. Her earthy humor and fast-paced plots delight her fans, while critics applaud her offbeat characterizations and inci Since publication of her first novel in 1986, Sonja Massie has authored over sixty published works, including the highly popular and critically acclaimed SAVANNAH REID MYSTERIES under the pseudonym G. A. McKevett. Sonja's novels range from Irish historicals to contemporary thrillers. Her earthy humor and fast-paced plots delight her fans, while critics applaud her offbeat characterizations and incisive observations on human nature. Irish by ancestry, Sonja has authored two non-fiction books on the history of Ireland: THE COMPLETE IDIOT'S GUIDE TO IRISH HISTORY AND CULTURE and IRISH PRIDE: 101 REASONS TO BE PROUD YOU'RE IRISH. Both books impart detailed knowledge of the complex and controversial Irish story with a light hand and plenty of humor. Her Irish novels include: DREAM CARVER, CAROUSEL, DAUGHTER OF IRELAND and the bestselling FAR AND AWAY - the novelization of the Ron Howard movie starring Tom Cruise and Nicole Kidman. On nationwide tours, Sonja lectures to published and "pre-published" authors in her workshop, "The Novel Approach," a seminar which covers such topics as: story structure, characterization, plotting, pacing, and marketing manuscripts. Sonja has taught numerous courses at university and adult continuing education facilities including: general fiction, historical research, and mystery writing. She was managing editor at "Single Living" magazine and has functioned as a manuscript doctor and storyline editor for major publishers. Earlier in her career, she was a prolific ghostwriter, authoring both fictional and non-fictional books for celebrities and professionals. Having lived in Los Angeles, Toronto, and County Kerry, Ireland, she now resides in New York.